I suppose that depends on who you ask. In recent years, the award has fallen into controversy as was reported by Wired.com back in 2015. I won’t try to quote from that source since it’s lengthy, but the upshot is that there’s been some “back and forth” as far as who can vote, how to “game” the votes, and who is “allowed” to win or not. Part of the concern is that marginalized groups such as people of color, LGBTQ+, and other populations of authors have experienced being excluded, and another part is that conservative, religious, straight, male authors have felt the same way. This came up again because one of the complaints by those who have criticized this year’s WorldCon, is that Hugo nominated authors have been excluded from programming due to their being new and relatively unknown. I suppose this is a little like how actress Scarlett Johansson was chosen to play a transgender man Dante “Tex” Gill in an upcoming film called “Rub & Tug.” Maybe she wasn’t the best choice for the role, but she is a big, box office draw, and the movie’s producers probably wanted to bring in the widest possible audience, especially since there are going to be a certain (possibly very large) set of the population who won’t naturally want to see the film based on its subject matter. In the end, Johansson dropped out of the project because of the massive backlash she received from the LGBTQ+ community specifically, and social justice advocates in general. Now, a transgender person can be selected for the role, but the trade-off is that individual will most likely not have the same audience draw as a talent like Johansson. If that’s how the studio wants to play it, it’s their call, but my guess is that they traded social justice propriety for profits, and let’s face it, any corporation’s bottom line is profits. So let’s say WorldCon was thinking in the same direction, choosing to put big names in their programming while setting aside, worthy and Hugo nominated authors who were not as well-known. Is this right or wrong? Depends. If you plan to draw the widest possible audience, you need to provide a reason for them to come in. On the other hand, if you want to promote new talent (I almost wrote “young,” but I’m living proof that new doesn’t have to be young – assuming I am ever published in SF/F), you should showcase them. I guess the “happy medium” would be to put established and new talent on the same panels, but that’s just me. But let’s get back to the Hugos. Are they still worth it? I don’t plan on doing exhaustive research, so I’ll cut to the chase and go to a year old discussion on reddit (yeah, I know). One interesting question is whether you’d want your book to win a Hugo or end up on the New York Times bestseller list. Both will promote your book, but in order to achieve either, people have to know about it anyway. I remember back in the day (this would be the 1970s in Berkeley), going to my local SF/F bookstore (I was still too ignorant to consider the public library first) and buying books because they’d won a Hugo or some other award. I figured there was probably a reason they’d won, such as intelligent and experienced people who knew a quality story when they read one, had voted for the book because it was really, really good. I think back in the day, that was correct. But what about now, especially considering the controversy reported by Wired? What if, just what if, various SF/F works are being voted on and elevated more for their positive presentation of progressive, leftist, social justice themes as well as the identity of their authors, rather than the objective quality of the stories? I’m not saying that is or isn’t happening, but I do recall (I don’t remember where or when, but it was in the past year or two), reading an award-winning short story about an intelligent and conscious (I won’t say sentient because all that means is an organism that can feel – sheep are sentient, but not particularly intelligent) search engine that gamed each person’s search results to produce the best possible outcome in their lives. The story was a blatant, in-your-face advertisement for social justice causes, and it wasn’t even that well written. EDIT – July 26, 2018: I found the story I mentioned in the paragraph above. It’s called Cat Pictures, Please by Naomi Kritzer. You can read the full story online at Clarksworld.com (and I’m sorry, Naomi. It’s a cute story, but its intent is pretty obvious, and based on my experience with Hugo award winning SF/F from decades ago, it didn’t have that “blow me away” quality). But that’s only one example. I have no others to draw upon (I don’t have the time to do a thorough search of all award-winning short stories and novels, read each one, and then assess their relative merits based on my personal standards (though I’d try to be as objective as possible). Besides, I don’t have that much money for books, so they’d have to be available through my local public library system (I love libraries). I think this is the concern of the so-called “puppies,” either Sad Puppies or Rabid Puppies (sorry, I couldn’t find a relevant link for the latter). File770.com is the online version of Mike Glyer’s science fiction fan newzine, reporting on fanzines, sf clubs, conventions, fan funds and fanac. File 770 is named for the party in Room 770 at the 1951 Worldcon that upstaged the convention. That wasn’t so bad, compared to how they’ve described some other conservative voices (relative to Idaho, I’d probably be considered a moderate, but in the Bay Area and similar places, not so much). [Person’s name concealed]: Pyles may not be outright abusive, but he’s taking massive liberties with the truth. And in a really uninformed way. James Pyles: I don’t think it ever occurs to very many people that you don’t have to exclude “traditional” voices to include “underrepresented” ones. Of course this occurs to many people. The problem is that when more underrepresented voices are included, it means that there is not going to be room for all of the traditional voices who used to be included — and those voices get very loud and angry when something to which they feel they are entitled is not offered to them. Welcome to my fifteen minutes of fame. Thanks, folks. Frankly, I would probably be thrilled if anything I wrote either won a Hugo (or other award) or ended up on the New York Times bestseller list, but right now, the chances of any of that happening are slim to none, not only because I’ve yet to be published (I’ve finished the first draft of my novel, but it requires massive editing, and my discretionary time is limited, and as for my short stories, I’ve got six rejections under my belt, another nine submissions pending, and one short story that I’m still writing/editing), but I don’t have a true measure of whether or not anything I write is outstanding such that it would be worthy of an award. I’ve got a long way to go and I’m not getting any younger. As for anger, I’ve already written about the relationship between pain/fear/threat as the necessary precursor to anger in Toxic Fear and Things that go Bump in the Night and on Social Media as well as in When Social Media Becomes a Lynch Mob. Feeling threatened and responding with anger is a human biological response (actually, we share it with a lot of the animal kingdom), and it’s not the sole property of conservatives or liberals. 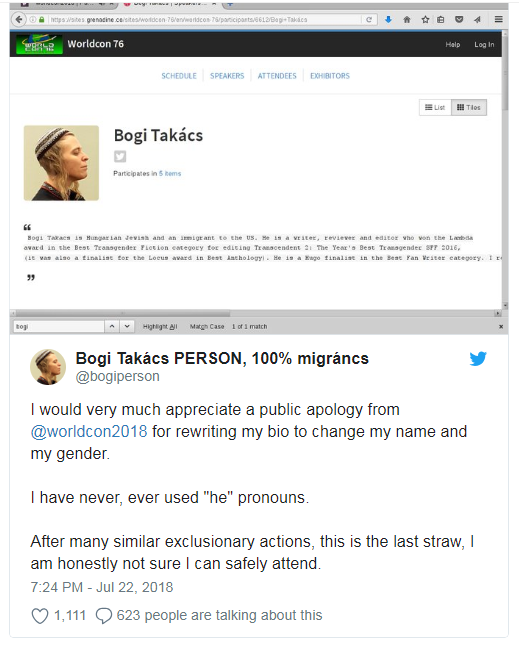 I think everything we’ve seen in this year’s WorldCon meltdown has established that quite well. I’m still not sure what safety issues and danger were involved, but then, I don’t have Bogi Takács’s lived experience. I do know that any award or being put on any list, no matter how historically (or even currently) prestigious, won’t be worth the time of day unless first and foremost, the award is granted based on the story being a good, quality story, reaching people where they live, not because it merely speaks to one side of the aisle or the other (or some sub-group within a side). In the end, the best story is a human story, one that can talk to the commonality we have a people. If the tale’s focus is laser-narrow, the audience will be as well. That’s my opinion as a reader, and how, most of the time, I choose to write. Maybe I’ll show up at one of these Cons one day as a writer. I’m not sure, since I’m not a big fan of crowds (or contentiousness), and as I get older, I increasingly value calm, quiet, and reasoned dialog. If I do become published and especially if I receive some sort of award, I hope it’s because my stories have earned an audience for being good stories, not because I do or do not belong to a group, pigeonhole, or type. Addendum – July 26, 2018: I saw this in this morning’s funnies and somehow thought it appropriate. Part three of this saga is I was Curious About how the WorldCon 2018 Refit was Going. Interesting inside view of the awards. Politics seem to hover over everything. It probably always did to a certain degree, but now it’s getting much, much worse and turning the whole industry into a battleground, or perhaps a caricature. My problem with this statement is the idea that there is a limited number of slots for books. It is not a finite pie, not with the growing world of Indie Publishing. There really is room for everyone at the table. Even with awards you can add or change categories for any sub-group. Just look at how the Dragon’s breakdown. There is room for everyone without spitting on each other. To be fair, I think the quote you employed was speaking to space on panels at Cons, not published books. I have a very limited understanding of the Dragon awards and how they came about, so I can’t speak to that point, but as far as the Hugos go, they are probably a lost cause. While that may have been what the individual meant, I have heard (read) similar comments in regards to publishing. Con panels may have limited space (I’ve never been to a con so I wouldn’t know) I would think that, with a good hand controlling the panels, having voices from across the spectrum be done in a fair and balanced way. What I know about the Dragons is only what is available to the general public: a few years old, long forms only, broken down by sub-genre and the Dragons do not require a paid membership – anyone can nominate and vote. The Hugos, sadly, are becoming irrelevant. I agree. I think the meltdown at WorldCon was caused by disorganization and the left hand not knowing what the right hand was doing, which I suppose isn’t hard with an event that large. Then, of course, all of the “offense” occurred, motives were attributed, and things went downhill from there. Wow. I’d heard Daily Kos did a piece on WorldCon, but I didn’t realize that they too attempted to blame the implosion on the Sad Puppies, who are utterly not involved in this mess. The “not enough room for both” is the problem of the finite pie. Some people base everything in their life on the idea of a finite pie. Other people think it’s a big huge dose of hogwash. Consider if there is a finite pie? If so, then in order for anyone to “win” then other people have to be shown the door. Get out! The tent isn’t “big” it can never be “big”… the tent is small, and all good people are involved in tossing people out of it. Think about what that means for diversity… the tent is small. There’s not room for diversity. There’s not room for everyone, not room at the table, in the tent, there is just not enough pie. Except that the whole concept is a sad way to go through life, always upset that someone else has your share. And it’s hogwash to boot. So unnecessary. If a Con says we only have so many panels and room for only so many writers on a panel, I can see the “finite pie” as long as themes/topics are evenly rotated so established and new folks get some exposure. What I don’t understand is the disturbing news I’ve heard where established authors and even publishers trying to “deplatform” writers they don’t like for whatever reason. In that sense, there’s enough room in the world for everyone to produce and be heard. Not intending to be ornery, because of course you’re right that any given convention has a limited amount of programming to fill. And truly, after a while, the same people speaking on the same panels at convention after convention and year after year gets predictable and boring. With the exception of fans who haven’t gone year after year and just discovered a Con and really do want to hear the Author who’s been their favorite since they were small deliver her or his rehearsed stories yet again for the very first time. At the same time, though, in a very meta sense, it’s not true that there’s finite space. When more people go to conventions they tend to grow. Conventions that grow add programming tracks. The bigger problem is wanting to keep programming tight and rooms filled. There’s many a midlist author with a large fanbase and solid career who sits in a room alone waiting for anyone to show up for a reading. There’s almost always something scheduled opposite and what do you do? Programming can give you a slot. They might be wrong about how interested people are, but they can’t make anyone show up. One thing’s for sure. I’d never want to be in charge of programming such a circus. I inadvertently stumbled into a twitter conversation on this topic (it doesn’t usually happen to me) that I’ll probably post here in a bit (hopefully before my grandkids wake up). It was actually pretty civil, but I got the distinct impression someone was trying to influence my thinking. Whatever happened to the days when science fiction was all about writing and reading science fiction?